Curious on everyones thoughts on what are the hardest to find collectible items and a brief description of any that you might have. One item, I wish I had but have not seen for sale on Ebay or anywhere else for a few years was the day planner from TNT. I saw one listed for $ 15, buy it now on ebay maybe 5 years ago. I went to log in and buy it and it was gone that fast. At that moment, I said my first curse word in my adult life. Ok, several curse words. Hoped I would see another one pop up on Ebay but no luck. I guess the seller did not know how valuable that day planner was to B5 fans. Also, any props or one of a kind items from the show that you would never part with. Lastly, does anyone have a used prop from SLEEPING IN LIGHT ? Now that would be cool. Yeah, that $15 day planner would have been an incredible bargain. They usually go for over $100 the few times they do show up. Nice collection Jan. My favorites are the white models, concept art and for some reason, I like the napkins a lot as well. Is their anything you wish you had or you would buy it in a second if it became available for sale. I love the white models and concept art a lot, too. I think the things I'd be most likely to snap up if they came available would be things like the 'blip' bracelet that are instantly identifiable with particular episodes. A lot of that sort of thing was sold in the Warner Bros. auctions many years ago: Delenn's manacles from "Comes the Inquisitor", the cup that they drank out of when entering the Dreaming. I wanted some of those in the worst way but they were priced way out of my range. I think one other thing I'd adore having are any parts of Londo or G'Kar's outfits. Delenn's manacles. Interesting. I never would have thought of that one but that would have been a nice addition to your collection. Getting Mira to sign them would be sweet. The one item I would want most is the bench John and Delenn sat on in SIL.. As for G'Kar and Londo. I would love to get a hold of the Book of G'kar and from Londo just as a conversation piece, maybe one of his attributes that he showed off while playing cards. If I recall correctly, the Book of G'Quon went to Katherine Drennan and the Book of G'Kar may have been sold at JMS' 'garage sale' several years ago. Never saw any sign of the 'attributes', but I wouldn't be surprised if it ended up at a rental company for re-use. That happens often. I’m guessing these are pretty rare. I was looking around at old threads. What a wealth of knowledge. Great seeing that collection Jan. 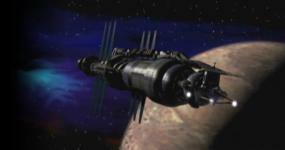 When and where will the Babylon 5 museum be announced? Y'know, people keep asking me that but not offering to finance it! Funny thing - I was just reading upthread how I wished I had a 'blip' bracelet in 2012 and I've got a 'blip' bracelet!